Riley is in training 3X a week, and the Saturday morning session is my chance chance to see him go. The video is below, some pix are here, and the progress is amazing. Pinch me! Over the last three months we've been increasing Riley's feed -- he needs more topline, more flesh, more ENERGY. Today, whether from the extra groceries or from the pleasures of working on a lovely, breezy morning, Riley was just plain happy and forward in his work -- no nagging, no whip needed, and he didn't seem too tired. The footing isn't hard but it's a bit just sand (as opposed to the indoor which has rubber and is groomed more consistently. While I looked hard for signs of soreness, he looks pretty good to me. If you can't watch youtube or if the ads are too annoying (I AM ANNOYED), see the same video on vimeo.com. I could not, can not, stop smiling. As a wise friend of mine said, hold on to these moments when you get them, because they'll get you through the bad moments that inevitably come and go. I had a great ride on Harvey too, he even gave me some nice shoulder in. Congratulations, I think all your hard rehab work just paid off!!! Gorgeous! What a fabulous time you two will have! Congrats! He is looking fantastic! All of that hard work during his rehab has paid off for you. You must be a proud mama!! He looks beautiful, but I think you already know that ;). Congrats!! He does look great! What a difference he has in his canter. I guess because Harvey is a TB, I thought Riley was too, but now I am thinking Hanoverian? Congrats! You have every right to be the proud mama - you picked him, you worked with him, you dealt with the rehab of him! And he looks awesome! Felicitas Von Neumann also thought he looked like a TB. 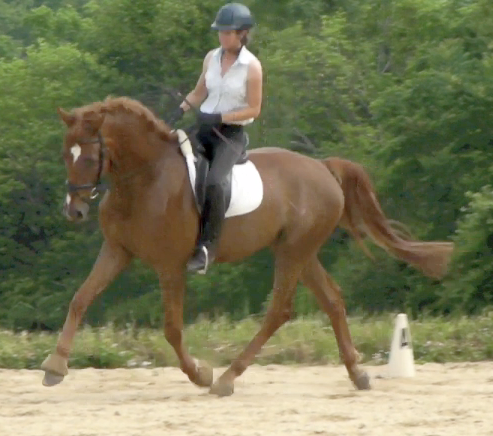 I like that he seems to be lighter than the avg warmblood. I often feel the same way. Isnt it great to be a proud momma-- like we produced them ourselves! He looks great - happy, relaxed, and sound! You should be beaming!